There is a great Whole Foods near where our son, Spence, goes to scouts. Since the store is 30+ minutes away from our house, we have him snag a few things. The one thing that they have consistently that I love is their shrimp! It is $9.99/lb all the time (it costs much more at our local grocery store) and it is already deveined and peeled. All the hard work is done and all I have to do is find a recipe to use it with! Sign me up!! Indoors, we love sheet pan fajitas and fajitas made in our cast iron skillet! You just can’t beat the cooking ability of a good cast iron pan. 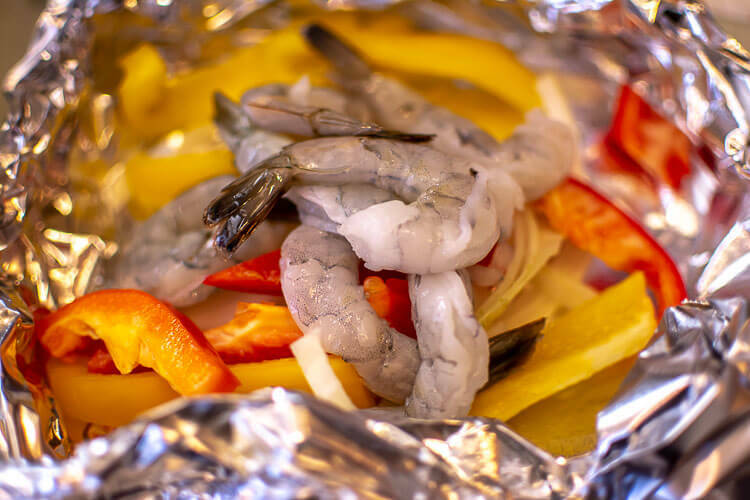 This weekend, we decided to throw together some shrimp fajitas in foil for the grill after we grilled the mango wings. Crazy as it seems, we cook these meals ahead of time for Jason’s lunch for the the week. He’s happy to have lunch prepared and I’m happy it’s over with! Win! Win! How to Make Grilled Shrimp Fajitas? These are super easy to make! If you need a quick dinner or you are having friends over but are short on time – this is a great option! Add some toppings, chips, and salsa and you’ve got yourself a party! Margaritas are optional but certainly appreciated! The first thing to do is to prep two layers of foil. You want to do this so that the insides don’t accidentally fall out through an inadvertent tear. Check your shrimp before you get started. Ours was already peeled when we brought them home but if yours are not, you will want to take a few minutes to peel them before you tackle this recipe. Toss the shrimp, onions, and peppers with the homemade fajita seasoning. You can use packaged seasonings, but I like to make my own when I can so I know what I’m getting. You will use about 2 tsp for the foil pack shrimp fajitas. If you want a stronger taste, add a tad more. 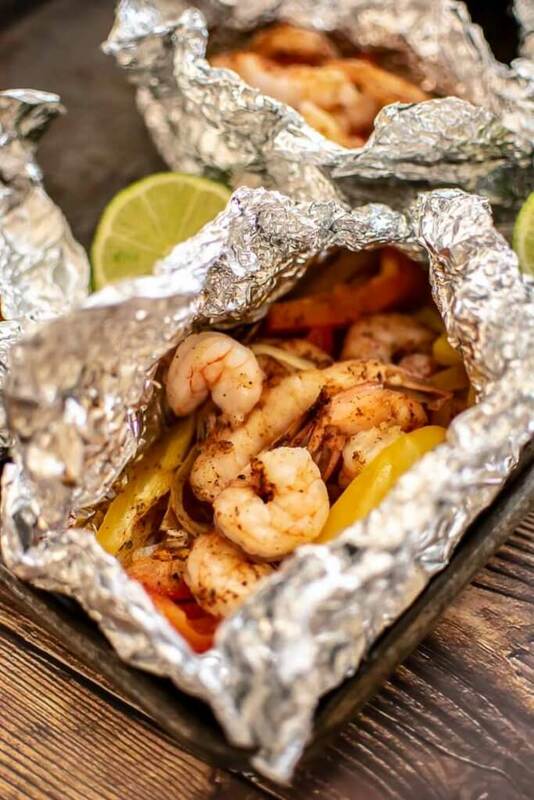 Divide the shrimp, onions, and peppers into the foil packs and wrap them up tight. They are ready for the grill. We serve these just as they are in the foil sometimes but have served them in flour tortillas topped with avocado slices, sour cream, and some cheese. I like eating straight from the foil pack as it is easier, and the cleanup is a breeze! For Jason’s lunch, I put them in sealed containers as they came off of the grill and he was good to go. It’s just too messy to try to bring tortillas to work and assemble. For two of the days, I had leftover rice and layered the rice with the shrimp fajita mix on top. It is extremely versatile. Just a note: this fajita mix is soft and tender coming off of the grill. 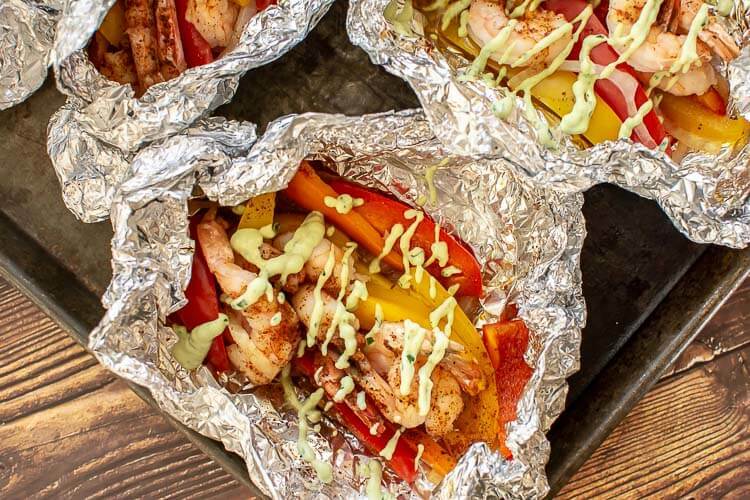 Being locked in the foil, they cook beautifully but if you are looking for that gorgeous char that you get from your favorite Tex-Mex restaurant or indoors on a cast iron skillet, this isn’t your recipe. I am seriously embarrassed to say that I practically licked the bowl clean on this one. I want this dressing every day! In a sturdy blender, used a sturdy blender or food processor. Make sure your avocado is ripe and ready to eat. The avocados that are as hard as a rock just don’t do well here. This is one of the “note to self” moments to buy it early or dig deep in the produce department to find the ripe ones. Combine the garlic, cilantro, peeled and cored avocado, sour cream and lime juice in a sturdy blender and blend on high. Add in half and half to make it the consistency that you want. I needed 2 tbsp but start with a little and add from there. This is a phenomenal dip, dressing for a Tex-Mex salad, or even a topping for baked potatoes. Did I say that I loved this dressing? Set up the grill for 350 degrees and direct heat. 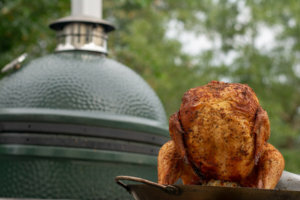 I used the Big Green Egg and removed the plate setter. Add the sealed foil packs when the temperature of the grill is up. Grill it for 10 – 12 minutes or until the shrimp are cooked. Remove it from the grill, add the avocado dressing and other sides and serve. 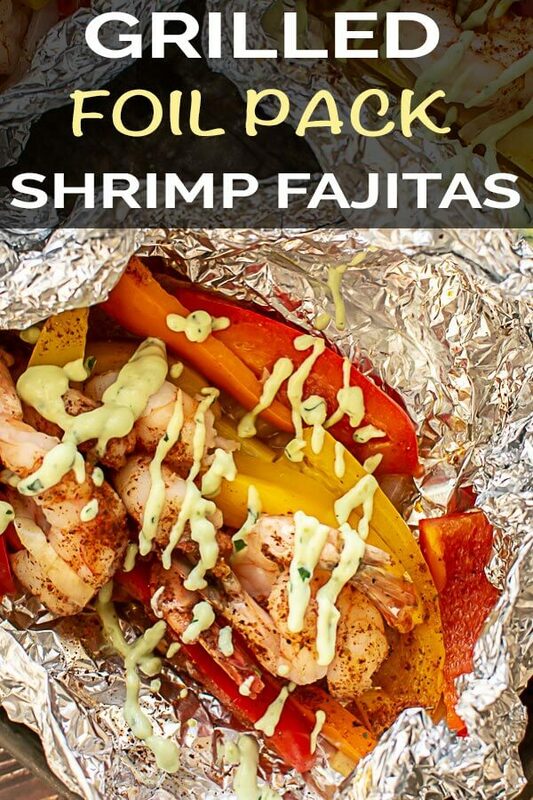 Super Fast Grilled Foil Pack Shrimp Fajitas are Delish! 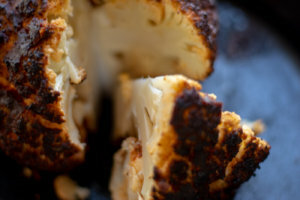 In just a few minutes, you’ll grill a classic dish! Mix all ingredients together in a bowl. Store and use as needed for recipes. Add all ingredients into a sturdy blender and blend. Add a little more milk or half and half as desired. 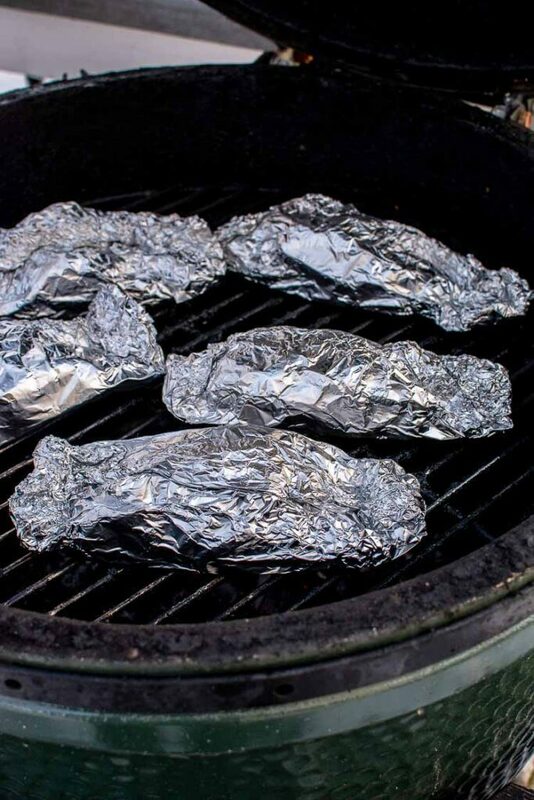 Lay out 4 stacks of aluminum foil, doubled up (for a total of eight pieces). Spray the inside so nothing sticks. 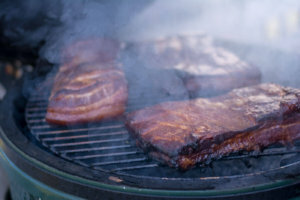 Heat the grill to 350 degrees with direct heat. 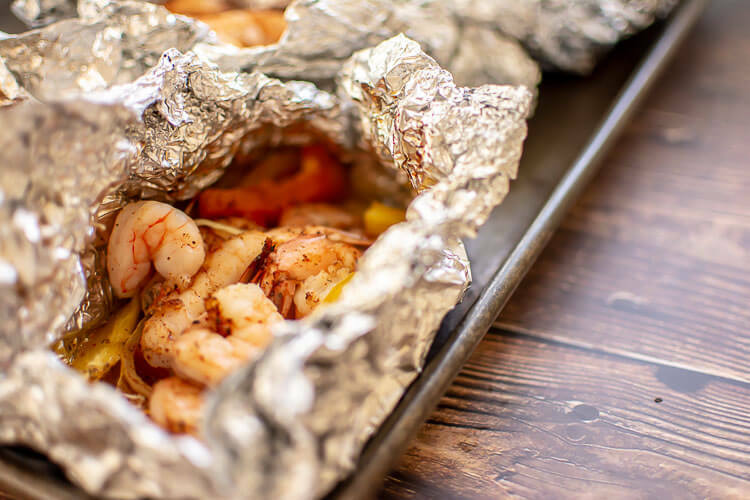 Divide the shrimp into the four aluminum foil packets. Add the sliced onion and peppers. Sprinkle with the homemade fajita seasoning. Wrap up the fajita packets tightly so they don’t leak out. Serve with cheese and avocado dressing by itself or wrapped up in a soft tortilla shell.